As China’s economy grows rapidly – so is their banking industry. Chinese banks are significantly growing both domestically and internationally– no wonder it constitutes the largest global banking sector in the world. As we are all aware, China has the highest number of exports, so it established numerous banks to make money remittance to China easier. As of 2016, China has over 4,398 different banking institutions domestically. Basically, the country’s bank industry has made phenomenal strides into contributing to the growth of its economy by making the inflow and outflow of money more efficient, by providing funds to businessmen to start or expand businesses, and by providing home and student loans to help citizens fulfill a career or dream. Below are China’s big 5 banks – all of which are among the largest banks in the world. Agricultural Bank of China: ABC or AgBank is one of China’s “big four” banks that was founded in 1951. It was ranked top 3 among the world’s biggest banks in 2017, and it’s one of the country’s five top lenders. The bank’s main principle is to seek progress while maintaining stability and promote supply-side structural reform to support national economic development. Adhering to this principle, ABC regarded green credit as major direction for business development and structural adjustment. Bank of China: BOC was founded in 1912 and was one of the oldest banks in China. From 1912 to 1949, the Bank served consecutively as the country’s central bank, international exchange bank and specialised international trade bank. Fulfilling its commitment to serving the public and developing China’s financial services sector, the Bank rose to a leading position in the Chinese financial industry and developed a good standing in the international financial community, despite many hardships and setbacks. In 2017, BOC was ranked as the 4th largest bank by assets in the world. Bank of Communications: BoComm was establish in 1908 and was also one of the oldest banks in China – just a few years older than BOC. It was one of the first banks to have issued banknotes and became one of the major financial service providers in China. BoComm covers commercial banks, securities, trusts, financial leasing, fund management, insurance, and offshore financial services. In 2017, it was listed as the 34th world’s biggest public company and 24th on the list of the World’s biggest banks by Forbes. China Construction Bank: CCB is one of the “big four” banks in China and the country’s second largest lender by assets that was founded in 1954. In 2017, CCB was ranked 2nd in the World’s Top 1000 Banks by the UK magazine. As of 2017, the bank has over 14,985 banking stores & 251 overseas entities. This year, it has opened a branch in Shanghai managed by robots run by pure technology including facial recognition (FR), artificial intelligent (AI) and virtual reality (VR). Industrial and Commercial Bank of China: ICBC is the world’s number 1 largest and richest bank by total assets (26 Trillion RMB). It’s a state-owned commercial bank that was founded in January 1, 1984. ICBC is listed as number one on the World’s Biggest Public Companies by Forbes and has surpassed Wells Fargo to become the world’s most valuable banking brand. PSBC is one of China’s leading large retail banks and one of the country’s biggest lender which was founded in 2007. Today, it has over 40,000 outlets and over 500 million retail customers. In 2017, PSBC was ranked 19th among the World’s biggest banks by Forbes. IBC is a national joint-stock commercial bank that was founded on 1988 and headquartered in Fuzhou, Fujian Province. Today it has 119 branches and 1787 sub-branches in the major cities across China. Recently, ICBC wins the Élan Award, the “Oscar” in the Global Card Manufacturing Industry. In 2017, it ranked 14th among the list of world’s biggest bank by Forbes. CMB was established in 1987 in in Shekou District of Shenzhen. Today it has over 1800 branches, including 5 overseas branches and 3 overseas rep-offices. In 2016, CMB was awarded “Bank of the Year” by the Banker magazine. China CITIC Bank is a commercial bank in China that was established in 1987. The bank is part of the CITIC Group Corporation – China’s largest conglomerate and a constituent of the Hang Seng Index. Today, CNCBI has 33 branches in Hong Kong, as well as branches and presence in Beijing, Shanghai, Shenzhen and Macau. CNCBI also has overseas branches in New York, Los Angeles and Singapore. CMBC is a commercial bank mainly owned by non-state-owned enterprises which was founded on January 1996 in Beijing China. It has nearly 3,000 branches, sub-branches and outlets, and around 58 thousand employees. In 2016, it ranked 14th on Forbes’ 25 largest companies in China and 65th globally. SPD Bank is a commercial bank that was founded in August 28, 1992 and started operating in the year 1993. Now, it operates a network of 42 branches and over 1,800 banking outlets inside and outside China. This year, 2018, the bank was ranked 13th in the Top 500 Banking Brands list released by the British magazine The Banker. CEB is a national joint-stock commercial bank that was established in August 1992 in Beijing, China. The bank has 1,196 branches and outlets covering 129 economic center cities across the country. Among its many awards are: “Gold Asset Management Bank of the Year” by Financial Money and “Best Private Bank” of the Year by National Business Daily. PAB is a nationwide joint-stock commercial bank headquartered in Shenzhen which was founded in June 1995. Today it has over 58 branches and 1,037 outlets across China. Customer acquisition, intelligent master account, customer base, products, channels, IT and structure – these are the bank’s 7 key strategies. It focuses mainly on providing loans to small and medium enterprises. Hua Xia Bank is a nationwide joint stock commercial bank established in Beijing China in the year 1992.It offers deposit accounts, foreign currency deposit, currency trading, international banking and financing such as working capital loan and guarantee loan. The bank was listed 255th among The World’s Biggest Public Companies by Forbes. In 2017, its assets amounted to $340.9 B and earned a profit of $3B. Today it has 33 tier-1 branches, 23 tier-2 branches, 12 cross-city sub-branches and 437 outlets in 68 major cities. CGB is one of the earliest-incorporated joint-stock commercial banks in China that was established in July 1988. As of 2017, the bank has 43 Tier-1 branches and 843 business outlets across the country. The bank has covered over 300,000 corporate customers, 34.22 million individual customers, 57.11 million credit card customers and 24.27 million mobile banking customers. Among its many awards are: Best Individual E-banking in 2017 by China Financial Certification Authority and Best Transaction Banking Service Award by Global Finance. Bank of Beijing is a Sino-foreign joint stock commercial bank that was established in 1996. Today it has over 600 branches located in over 10 domestic major cities. At its first quarter of 2018, its total assets amounted to 2.39 trillion Yuan and already reaped a 5.811 billion Yuan profit. Bank of Beijing has 4 pillars: Corporate Banking Business, Retail Banking Business, Treasury Business, and Other Business. Bank of Shanghai is a joint-stock commercial bank formed by state-owned shares in December 1995. Currently, It has over 315 branches and over 10,000 employees. The bank covers principal business segments such as Corporate Banking, Retail Banking, and Treasury Business. Among its many awards are “Best Development Award of Syndicated Loan Business” by China Banking Association and “Best Member of Forward Exchange and Swap” by China Foreign Exchange Trade System. HSBC: HSBC is one of the first foreign banks that has incorporated in China in April 2007. It’s a Hongkong based bank that was founded in 1865 to finance trade between Asia and the West. Today it has over 3,900 offices in 67 countries, 170 outlets of which are in China. For consecutive years, HSBC was awarded as the “Best Foreign (Commercial) Bank in China” by FinanceAsia. The Bank of East Asia: BEA is another Hongkong-based leading financial services group that was incorporated in 1918. Today, the BEA Group operates one of the most extensive networks of any foreign bank on the Mainland, with outlets in 44 cities nationwide. Standard Chartered Bank: SCB is a leading International bank founded in1969 in London, England. In China, SCB has incorporated its first branch in Shanghai. Along with HSBC, CSB incorporated in China in April 2007. Standard Chartered has one of the largest foreign bank networks in China – with 17 branches, 42 subbranches and 1 Village Bank. Hang Seng Bank: HSB is another Hongkong-based banking and financial services company founded in 1933. HSB was established in China in May 2007, now it has a network of 46 branches and sub branches in China. Among its many milestones in China, Hang Seng recently announced the launch of Mobile Video Teller Machine, becoming the first foreign bank to launch this service. Citibank: Citibank is one of the leading multinational banks in the world that was founded in 1812 in New York City. Citibank is the first American bank established in China, it is pretty well-known for its credit cards, loans, investment and insurance policies. Along with the previously mentioned banks, Citibank has incorporated locally in China in 2007. 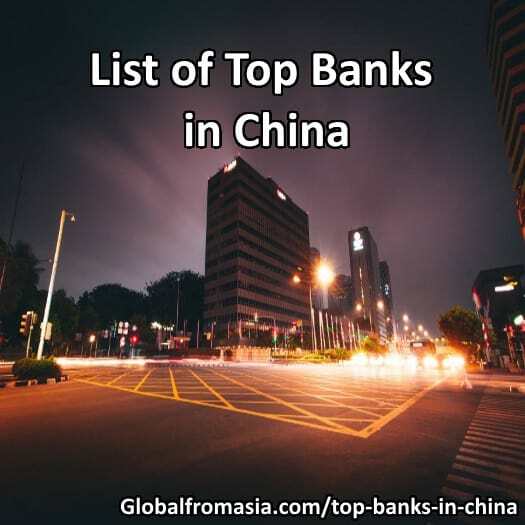 Today it has more than 47 bank outlets in thirteen cities across China (Beijing, Changsha, Chengdu, Chongqing, Dalian, Guangzhou, Guiyang, Hangzhou, Nanjing, Shanghai, Shenzhen, Tianjin, Wuxi. China’s banking industry is growing rapidly both in domestic and in abroad. In fact, 4 out 5 largest banks in the World are all from China. International banking and e-commerce is taking the world by storm and these large banks are certainly in the game! Do you plan on opening a bank account in China? Read our blogpost on how to open an account in China!